On our second week here in Puerto Rico we met a lovely couple by chance, Scott and Ann MacDonald, who very kindly invited us to a Puerto Rican dinner at their holiday home. We were pleasantly surprised when we arrived as a husband and wife chef team (she’s Puerto Rican and he’s Hong Kong Chinese) from the Chophouse restaurant were already hard at work preparing the multi-course dinner we were about to enjoy. To start, we had some cold mojitos – rum, sugar and crushed mint – while we waited for the other guests to arrive. Soon after, the other four guests arrived and we sat down to dinner. First course was a simple and delicious tuna ceviche inside half an avocado – the tuna was fresh and tasted of sesame oil and lemon and the avocados were creamy. Next course is were two typical Puerto Rican starters – pastele, which is similar to a tamale and usually eaten at Christmas, is made of mashed plantain, green bananas and yucca with pork wrapped in a banana leaf and steamed. This was accompanied by bite-size crunchy pastries called pastelillo (like open empanadas) filled with shredded crab and olives in a tomato sauce. The pastele is quite filling and not really sweet or salty but the crunchy pastelillos were delicious. A salad course came next – conch and octopus over greens – fresh and served just with a light lemon-based vinaigrette. The piece de resistance was the main course of traditional lechon asado, spit-roasted suckling pig, served with yellow rice (rice cooked with chorizo and red peppers), beans and plantain stew and bacalao – cod fish cooked in a tomato-based broth. Lechon reminds me of back home so I had two servings of the tender meat with several pieces of crackling (crispy skin) with the rice. I was so full by then that I thought I didn’t have space for dessert but since it was another Puerto Rican specialty, I had to try it – guava jelly over queso fresco (fresh white cheese) and a shortbread base. The cheese complemented the sweetness of the guava jelly and was a nice end to the meal. It was a wonderful introduction to Puerto Rican food. I’m looking forward to discovering more about Caribbean cuisine and the different ingredients they make use of. Thanks Scott and Ann for the entertaining evening and the delicious dinner! This is the third time Ann and I have hosted this dinner, and Jessica and Sam continue to top each performance! 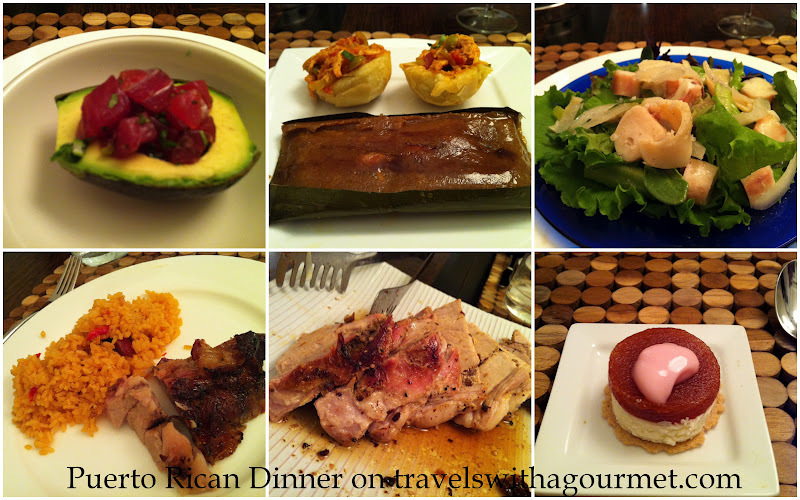 This evening was magical….fabulous food, awesome wine, new longtime friendships.